The apartment was very nice, clean and well equipped. We need a quick place to stay for the night and rented the same day. Was nice and clean. Had parking available for 15€ for the night. Was a little noisy but it ended by 11pm and we were able to get a decent night sleep. Had everything we needed. Apartment was about 2 blocks from where we parked our car and checked in. Staff was very nice and helpful. Close to beach, good staff, cute apartment with plenty of space. Quiet residential area, near great restaurants and near a bus stop and metro. Very close to the beach, great family friendly neighborhood. This was a good deal. Location was close to beach. And the beach is nice area. The apartment was roomy and had almost everything I needed. What a comfortable and well equipped apartment. We will definitely stay here again. great and safe location in Poblenou. Easy entrance to appartment. Communication prior to arrival was excellent, we found the appartment very easily. The neighborhood is supercosy, not crowded, lots of cosy bars and restaurants, and close by the sea. We were travelling with a toddler and an infant so convenience was extra important. It was perfect for a young family, easy to go to the beach and home again for a short nap at noon. Supermarkets nearby with delicious fruits and vegetables. I'd definitely come back to this place again when visiting Barcelona. The center was not too far off. We walked to Sagrada Familia. The staff at Feelathome Apts was extremely friendly and helpful. Our kitchen didn't seem to work so someone passed by when we called at 6pm and showed us how to use it. They were very helpful for recommendations in the neighborhood too. 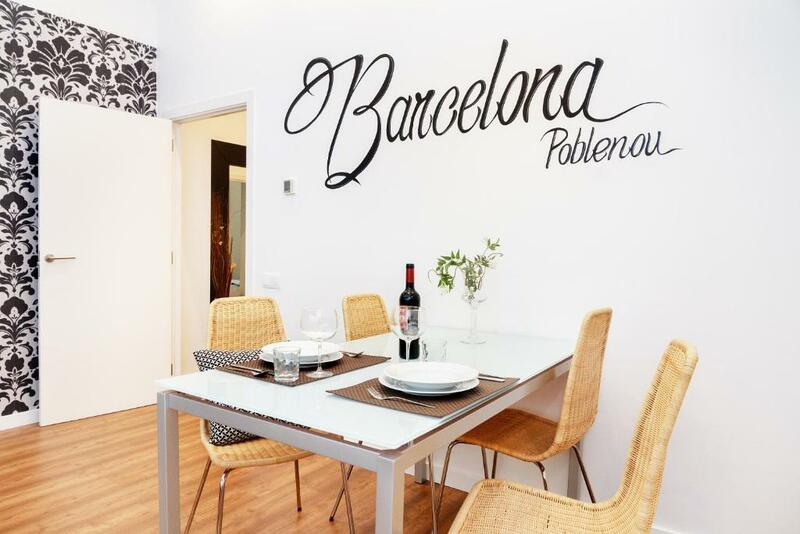 Lock in a great price for Feelathome Poblenou Beach Apartments – rated 8.4 by recent guests! 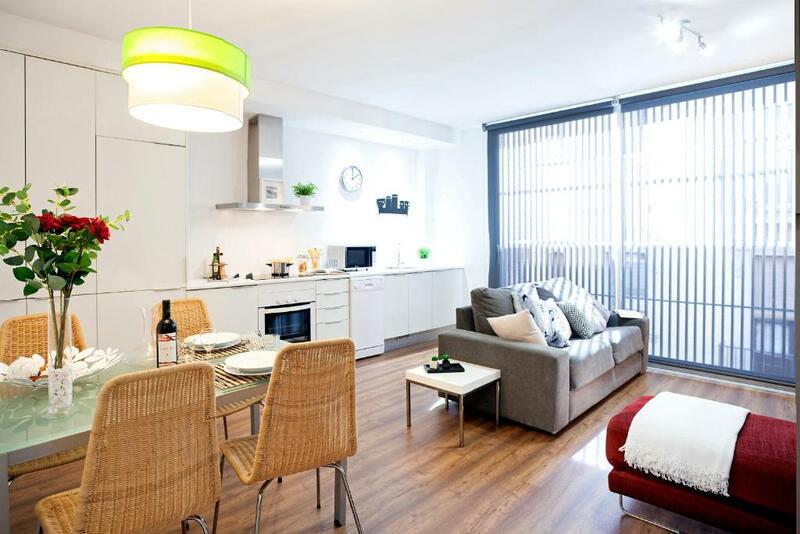 These modern apartments are in the Poblenou area of Barcelona, 1,650 feet from the beach. Free Wi-Fi is available in rooms and in public areas. The CCIB Convention Center is within walking distance. Poblenou Metro is 650 feet away and a 20-minute ride takes you to the city center. There is easy access to the Gaudí buildings on Passeig de Gracia. The apartments located in 2 separate buildings, 700 feet apart. All of them have a private kitchen complete with a washing machine, dishwasher, and oven. There is also a living room with a flat-screen TV. Some apartments have a private terrace or balcony, and a communal terrace is available on the top floor. Private parking is available at an extra cost. Nonsmoking and family apartments are available. 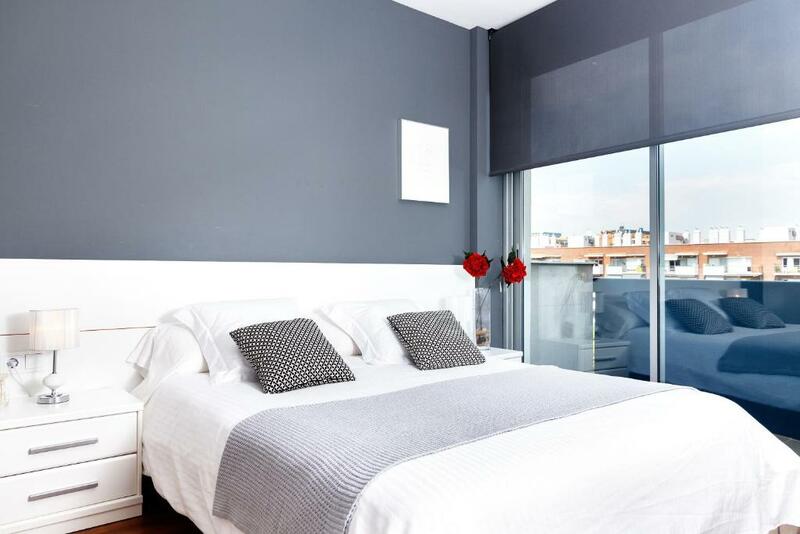 The pictures at the top of this page are a selection of the different apartments located in the Poble Nou area in Barcelona. Please select a date and click on the apartments to see the pictures of the individual apartments. When would you like to stay at Feelathome Poblenou Beach Apartments? 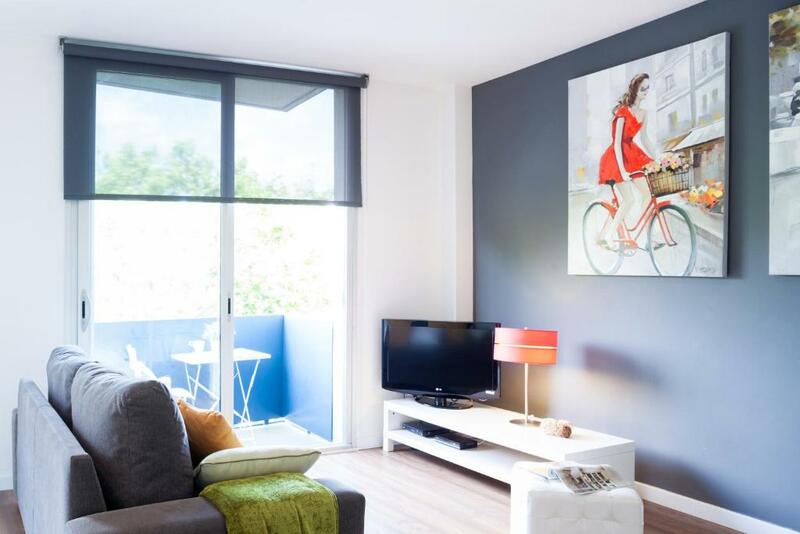 This apartment has 1 double bedroom and a double sofa-bed in the living room. Please note that not all the apartments come with balcony. This apartment has 1 double bedroom, 1 bedroom with twin or bunk beds, and a double sofa-bed in the living room. Please note that one apartment doesn't have a balcony and second bedroom comes with bunk beds. This apartment has one double bedroom, a double sofa-bed in the living room and a private terrace. Featuring a private terrace, this apartment has a double bedroom, a room with bunk beds and a living room with a double sofa bed. This apartment has a bedroom with an extra large double bed and a full kitchen. The private bathroom features a shower. Located on the ground floor, this split-level apartment comes with a kitchen and living area; the bedrooms and the bathroom are located on the upper level. 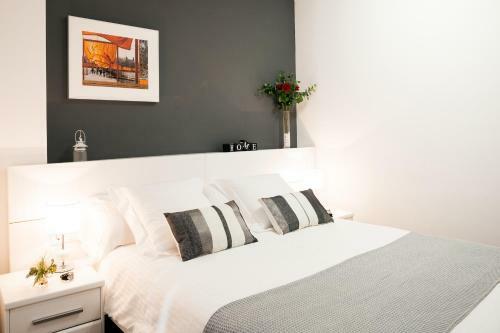 This apartment has a double bedroom with an extra large double bed and another bedroom with a set of bunk beds. There is a full kitchen and the bathroom includes a shower. House Rules Feelathome Poblenou Beach Apartments takes special requests – add in the next step! Feelathome Poblenou Beach Apartments accepts these cards and reserves the right to temporarily hold an amount prior to arrival. Please note that guests must present the credit card used to make the reservation upon arrival. If the guest is different from the cardholder, please contact the property in advance. Airport transfer was billed €55, we saw his phone had the actual bill he wasn’t trying to rip us off, but the property had agreed €45. We were left in the awkward position of having to tell him we definitely agreed €45. He then had to call the transfer organisers who eventually agreed on €45. Needs updating, freshen up painting etc. Great location, good value for money. We were pleased. Location, roof terrace (room 4 on level 1), good staff in the office. Clean, bright and sunny. Comfy beds. The front door - to noisy and the noise feels like the sound from the prizon gate from the movies :) ; the dining table its unstable; I staid at groudfloor so there were some group of girls in the night (2..3AM) and heard the noise really loud. The check-out could actually be done in the form of the code-based lock for the key with no need to go into the company office (even though it's really close). The same for check-out. Everything one can need during the stay, be it long or short, is there. Nice clean apartment close to supermarket, restaurants and beach! Very well equipped. Location is perfect - close to the see and to the metro, many eateries and stores around. Good for recreational stay as well as easy to go to the center. Apartments are well equipped with ALL things including kitchenware. Appartment is situated on the first floor and the central doors blocs and opens automaticly with horrible sound, if you have sensitive sleep it bothers and annoys a lot. As it was my business trip, i've asked for invoice three times but haven't received it.